It’s getting cold again. Eisbrecher are picking up steam once more, shock-freezing the gothic/industrial/rock/metal genre on August 18 – with heavy grooves in their hearts and a broad grin on their face. They’re all right to laugh, after all. Having started off as a small raft in the wild rock metal sea in 2003, perfectly steered by the two captains Alex Wesselsky (vocals) and Noel Pix (guitar, keyboards, programming), Eisbrecher by now are an institution of the scene that loves black tunes, hard riffs, plenty of melodies and tantalizing electro. For a long time, this was called “Neue Deutsche Härte” (“New German Heavy”) – which today sounds anachronistic, given that Eisbrecher have roughly 15 years of experience under their belt. Anyway, this corset has long since become too rigid and narrow-minded for the Bavarian band. Instead of copying and reciting, Alex and Pix have created their own space between the poles of the scene’s big names with their past six studio albums. The reception proves them right: The last two albums DIE HÖLLE MUSS WARTEN (“HELL MUST WAIT”, 2012) and SCHOCK (“SHOCK”, 2015) have already gone Gold in Germany, and when Eisbrecher mount the live stage, there are 4,500 people attending in Munich alone and Special Guest appearances with the Scorpions or Alice Cooper are no rarity anymore. A popularity produced only by a few bands, who blend German lyrics and heavy rhythms – Eisbrecher are unique like that. The two protagonists are singular on other levels as well: While Pix maintains his position on the bridge, continuously working on Eisbrecher’s sound framework, Alex goes ashore as an ambassador of the cold waves and works in service of the polar bear in multiple ways: As a presenter on TV, a host of the Metal Hammer Awards, or as Ice General Arktos in Peter Maffay’s “Tabaluga” story (alongside widely popular German actors Uwe Ochsenknecht, Heinz Hönig, and Rufus Beck), having delighted an audience of around 350,000 people at 64 shows. There is nothing that Alex Wesselsky doesn’t master with ice-cold precision and brilliance. Together they are twice as strong and so, for some years, there has been only one direction for Eisbrecher – and it’s called success. With STURMFAHRT (“STORM VOYAGE”), Eisbrecher have once again erected their own monument, which is set to be painted golden after its release in August. 14 songs in total, all of them hitting home. One and a half years of work went into the album and the pre-released single “Was ist hier los?” (“What’s Going On Here?”), which showcases them up to speed with content and Zeitgeist, has already rattled the roof. “Many fans expect a band with a major deal to betray rock music. We love to keep surprising people by showing them that Eisbrecher are flying the flag of heavy music”, beams Alex. The other album tracks were written with exactly the same confident attitude and are brimming with creativity. 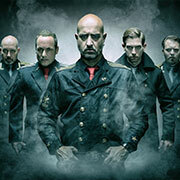 Whether it’s crisp gothic metal, riffs of steel, and danceable beats – like in the title track “Sturmfahrt” – groovy monster tracks like “Krieger” (“Warrior”) or pure head bangers like “Der Wahnsinn” (“The Insanity”): STURMFAHRT is the two musicians’ most eclectic album, because Wesselsky and Pix know that stagnation spells death. That’s why they have decoded the success formula of their last albums and enriched it with even more enticing content. This way, they dare to tackle a song like “Wo geht der Teufel hin” (“Where Does The Devil Go”). It may take some getting used to – however, the song turns out to be a pure mega hit. It’s love it or hate it in this case. With this crystal clear pop ballad, the duo from Munich tears down genre borders and produces an all-rounder. Catchy, smoochy grooves and congenially bittersweet lyrics, that once again showcase singer Alex operating in the here and now. Caustically and ironically boiling the topics down to their essence, a wink of an eye every now and then. As a cherry on top, there’s the – according to the fans – overdue cover version of “Eisbär” (“Polar Bear”) by NDW legend Grauzone, of course in a crispy Eisbrecher coating. Particularly outstanding is the remake of the classic “Das Boot”, penned by jazz legend Klaus Doldinger, who among other things wrote the theme of the renowned German crime series “Tatort”. Pix is especially proud of turning the original instrumental track into a perfectly rounded song, including apt lyrics. A little masterpiece, if you listen closely. 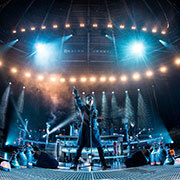 STURMFAHRT opens up a new level for Eisbrecher: no border too narrow, no obstacle too high, no genre too small. They continue to evolve, and have – to the fans’ delight – here and there upped their heaviness, clearly scoring with genius ideas. They’ve long since set the bar for heavy music with German lyrics – STURMFAHRT definitely adds to that. With STURMFAHRT on board, the battleship Eisbrecher can’t be stopped by anybody or anything, and sails close to the wind at all times; ever higher, ever faster, ever further – towards triumph! Eisbrecher’s new album STURMFAHRT is out August 18, and will be released on CD, double LP and the limited STURMFAHRT box, which includes bonus live DVD “Eisbrecher at Loreley 2016” as well as expedition goggles, a double pin metal emblem, poster, and stickers.